"The end came quickly," as authors of morbid weepies like to say. On Monday WiReD magazine editor Chris Anderson effectively admitted game over for his "Long Tail", the idea he's been dragging so lucratively around the conference circuit for the past four years. In as many words, he downgraded it from "the future of business" to something that's, er, not very helpful for your business at all. "I'll end by conceding a point: It's hard to make money in the Tail," Anderson wrote. "The revenues are disproportionately in the Head. Perhaps that will never change." As befits a quasi-religious cult, the straw that broke the Long Tail's back wasn't empirical evidence, but the Word of God. The Google God, to be precise - Eric Schmidt. Will Page's exhaustive analysis of tens of millions of music transactions from a giant digital music store had already prompted a last ditch stand. But it was remarks by Schmidt, however, interviewed by McKinsey, that prompted the downgrade. Schmidt said they make most of the money in the top 10 per cent of advertising inventory. "So much for 'democratization'," comments Tom Slee - who wrote about the post-Page fall-out for us here. 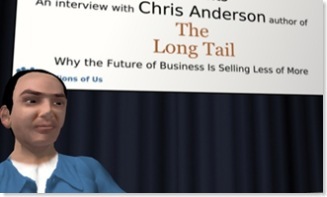 Chris Anderson promotes the Long Tail mythology in the virtual world, "Second Life". The virtual Anderson had hair. Connoisseurs of Cobblers and (future historians of Web 2.0) may be entertained by the titanic struggle Long Tail disciples now have: it's men locked in mortal combat with their metaphors. "I'm tempted to do a comparison between FatHead/LongTail markets and oscillators," writes one 'Panayotis'. "I'd love to hear from someone with a more solid background in physics who could take the idea a bit further," he adds hopefully. Yeah, oscillators. Why didn't we think of that? So for Anderson, it's on to the next instalment of trying to make the internet's turds smell like perfume. The Long Tail was a response to a 2003 essay by Clay Shirky which pointed out that Pareto Law distributions ("Power Curves" - with big "heads" and long but insignificant "tails") abounded on the net. This broke the utopian hearts, hence Anderson's propaganda offensive. His forthcoming book begs profitable companies to cross-subsidise Web 2.0 Fails.